We had tour from 4/16 to 4/19/2019.Our group guide Kitty was awesome. She was friendly, kind, nice and punctual as well. We could not go to the maid of the mist because of the weather but still it was a memorable tour. It was a very memorable tour.We are a family of three & my daughter thoroughly enjoyed it.We covered Secret Caverns,Niagra Falls & Washington DC.It was a pleasant trip.We had an excellent guide (Allen) who had tons of info & made the tour interesting.He had a great personality & made us feel very comfortable. Really enjoyed this tour - would have liked more time at Niagara Falls. Would cut out the Corning Glass visit to spend more time at Niagara. We had a great tour guide (Jason). I would recommend this tour if you are short of time - you get to see plenty of Washington DC - it was great. Our group guide James was really amazing. He was very friendly and arranged the whole trip nicely. We were a big group and we really enjoyed a lot. Though we could not go to Maid of the mist but still it was a memorable tour. Great experience...I would do it all over again but in Summer. Good value for money! Hotels were great and came with free breakfast. Too many places to see therefore a little rushed to fit the schedule. Our tour guide (Jin) was awesome, fun and knowledgeable and the captain (John) a good driver! We had a great time during our 3-day trip. Our tour guide, Jeff, is very nice and did an awesome job to be more informative and for everyone to enjoy the tour. The accommodations were superb. And salute to the drivers also. our first time to be on tour and will definitely recommend TakeTours to my friends and families. Thank you, Jeff, the drivers and TakeTours team for the experience! this tour was really amazing me and my friends had a great time. our tour guild Lillian He was really amazing she gave us a great tour by explaining the history of the places we visit. she would also tell us how much time we have when we make a rest stop and how long it will take before we get to our next destination. when we are heading to our hotel she will tell use what time we need to be on the bus and it was really helpful to us because then we know what time we need to wake up so we don鈥檛 miss our bus. she was an amazing tour guild and this tour was amazing for me and my friends. Shout out to our tour guide, Zack. He did such an amazing job and was also very polite. He made sure that everyone followed the itinerary and he had awesome educational explanations about each stop. My husband and I truly had a wonderful time! The accommodations and the buffet meals were great, as well. We can't wait book our next tour with taketours.com. Great job! I went on this tour with my family, it was 6 of us and we had a blast! We had a lot of fun but if there was one thing I would change it would be to spend less time at the Falls in order to spend more time in Washington and Philadelphia, but other than that, it was a great tour. Our tour guide, Kenny, was very sweet and very knowledgeable. Happy new year! I chose this tour two months ago. I had a wonderful trip. Thank tour guide Kitty Huang! There was a lot packed into the 3 day tour and Kitty did a great job keeping us all well informed about what to expect and what was coming up. She was very helpful and went beyond what would otherwise be expected. Great Trip. Our Tour Guide CECILIA And Driver Was very energetic and caring! My parents came visit me from India. I was so glad that I brought them to this trip. It was amazing.The tour guide Cecilia was very professional. We had a lot of fun. Thas was the first trip I took with my wife and I must say it was amazing. Everything went very smooth. Accommodation was nice and tour guide simon was very nice and helpful. Highly recommended. I want to thank the tour guide Kitty Huang. She is so nice. She took good care of all tour members. I would recommend this tour to my friends. Rachel was a good tour guide and made sure to complete everything as per plan. Disclaimer - long post I just got back yesterday from this 3 day tour which i took with my father and i absolutely enjoyed it. First things first - The entire trip was planned very well and managed very well considering a group of people in this trip ranged from 8 years to 70 years. Hands down to our tour guide Rachel Xu, she did an incredible job in taking responsibility of everyone in the trip, making sure everyone is comfortable. Even though some guest gave her a tough time she kept her calm and yet conveyed the message. She was not biased towards anyone yet paid heed to everyones concern. Brownie points just for her. Accommodation - pretty decent for the price you pay so no complaints here. Itinerary - I enjoyed the first two days of the trip which was the Niagara falls pretty much. I wish we could have somehow included Cave of the Winds but overall it was well planned. DC and Philadelphia trip i didnt enjoy much specially the DC cruise - it was pointless and we didnt even get to see the liberty bell. Transportation - i was comfortable with the bus considering the price we paid but my concern was for the elderly people. I think the bus could be little more comfortable so that its easier for them to sit for so long. I read lot of reviews saying, ample time was not given or there was no stop for restrooms but i defer to say that i think ample time was given for sight seeing including taking pictures and enjoying the moment. Also frequent stops were there to use the restrooms. Overall i enjoyed the trip and would recommend this to everyone who wants to just enjoy the trip and for once not be worried about arranging things etc specially when traveling with parents. Also a word of advise, its a group trip so be ready to adjust with different people and the overall itinerary. You cannot expect a group guided tour to be the same way you take with your family and friends. Tour started nicely and was very fun and memorable make sure to pack water bottle because you will be thirsty from walking around, be courteous to other passengers and you will enjoy the tour as we did! It was a great tour. However tour guide should be trained how to use the microphone, our tour guide put it too closed to her mouth and it was hard to understand, also her English should improved, it was hard to understand her. The bus seats are too closed to each other we were not confortable. I liked the schedule and punctuality of the tour. The places we visited were very nice and we enjoyed all the locations. This tour is fantastic, Our tour guide Justin was very helpful & knowledgeable. Arrival/Departure Timings were perfect. We have almost covered all the places. Our Lady Driver was very much energetic & her driving was good. It was our first trip in USA & we have enjoyed a lot. Things need to do: Carry Water crate - 40 Bottles & Fruits & snacks. Best tour from NYC. Hotel stay was also great. Guide Kitty has good knowledge and very nice person. Overall she took care of the trip really well. I am very satisfied with this guided tour. Our tour guide Rachael was very knowledgeable and friendly. They provided us nice accommodations for two nights. Everything was well planned. I highly recommend this tour! I am Santosh and I took this trip with my family. Our tour guide is Benny Chen. The tour was Very well planned and organized. Our guide, Benny Chen, was outstanding. He is so knowledgeable about the places we visited. Benny was so professional and conveys everything in a funny way, no one vets hurt and is so patient in answering the questions. We visited so many places in such short time. Rachel was able to plan and coordinate very precisely. Accommodation was good. We really enjoyed our vacation. It was a wonderful trip...well guided by Judy. The bus travel was quite comfortable, with AC and free wifi availability. Covered almost all the attractions in the cities we opted to travel with the company. Also the overnight stay was provided at premium hotels. Very well planned and organized tour. Our guide, Rachel, was outstanding. We visited so many places in such short time. Rachel was able to plan and coordinate very precisely. Accommodation was good. We really enjoyed our vacation. Very well planned and organzied tour. Our guide, Jake, was outstanding. Though there were many places that had to be covered in 3 days, he was able to plan and coordinate very precisely. I highly recommend this tour. I took this tour with my dad and wife. This was my third time with this company and it was a very satisfying experience. Emily is a very professional, knowledgeable and humorous guide. Our room in the Day Inn wasn't good though; they had just installed the new set of rooms and there were just too many problems with it. I strongly recommend the visit to Niagara Falls and Watkins Glen State Park. Well organised tour.Lots of places they cover in timely manner. Guide was informative. Overall well worth the money. I booked the tour for my family (4 people in 1 room). It was a good price! We had such a wonderful trip with tour guide Rachel Xu! It's not the easiest job in the world but she manage it very well. It was a pleasant trip with Rachel Xu. Nice tours. good hotel! Thank you for the wonderful time. You need the rest with your tough job, thanks again! Awesome tour! Our tour guide, Matthew was phenomenal, especially with my boisterous six year old. Will definitely book another tour! The Tour was really very good. Our guide Eddie was very helpful and was explaining each and every thing very properly. Also he was gibing in depth details about each spot which made the attractions more interesting. Hotel on Day 1 was very Good in Niagara but on Day 2 the Hotel Sheraton didn't had Microwave in the Room which was very disappointing. The buffet on both days was Chinese buffet with no other option so we had to search for out own dinner. Overall the tour was good and was really worth. it was a great tour. the price was just right, Lilian He (tour guide) was excellent. she knows what she's doing. very recommended. Excellent tour and itinerary, would recommend this! Thanks to our tour guide Harvey! Though we had the following points to say to the tour operator: 1. No vegan food stops, we were relying mainly on coffee and even that was not allowed inside the bus. 2. It would have been nice if the itinerary and break/lunch times were shared with us earlier before trip. We did missed a lunch on Day2 without knowing it was a break! Very nice trip, pretty beatifull the places we were, we had such a nice time, Allen Zhao, our guied, is a very nice person, good explanations all over the trip.However, we have a recommendation to get better transportation, there are much better buses than the bus we did the trip. thank you!! Overall it was good experience with take tour. I had a good experience on this tour, defiantly recommend for my friends and family. This is a highly recommended trip if you plan to visit surrounding NewYork for 3 4 days. The bus and hotel are great. Special thanks to Amy and Mike our tour guide and bus driver. They did an in creditable job to ensure trip is smooth and fun loving for the tour members. My family and me had excellent trip. Thank you to our guide Simon. We had a very good experience. I recommend this tour. Thanks Taketours for providing this tour. We would like to recommend our tour guide Boris to friends and families.He's very knowledgable about American history and geography.He's fluent in English and Chinese, the explanations were very detailed and informative. He kept us entertained in the 2000km(yeah in 3days) journey.We were impressed with his exceptional and professional service, that made our trip much more enjoyable and memorable. Our tour guide, Jake made the tour enjoyable. Not to forget our bus driver, Chris, who did a good job with the commute as well. Overall, this has been a very good 3-Day tour (Tour dates: Dec 2 - Dec 4, 2016). My family and I had a good experience with Take Tours.com It was very educational and fun. Their services is excellent. Thank You! This tour met all the expectations required by the customers as we travelled over 1300 miles safely across the various states. Boris the tour guide was excellent and extremely friendly. He also explained all the important details that were to be known based on the places we visited. The accommodation was nice for both nights and was well worth it for the price that we paid. Please note that the price only included accommodation and transport. There is an additional service fee, price for the attractions and meals. Once again this tour was extremely worth it and there was so much done in so little time that would have been challenging to do by yourself. Resonable price and be able to choose your visit as they are optinals. in budget. It was an awesome experience at affordable rate. Special mention of tour guide Caroline Zheng, who was excellent. Everything was well planned and executed on time. Tour guide James was very helpful, polite and spoke very good English. Accommodation was kind of average though we stay only for sleeping in the night. Felt like we were travelling for most of the times. Experience at Niagara was too good. Overall i enjoyed the trip. Recently I have enjoyed the 3-days tours (Niagara Falls, WashingtonDC, Philadelphia, Watkins Glen). This package tour is excellent and cheapest. Our tour leader "Jake Yang" is a very talented and friendly guide. He has excellent geographical and historical knowledge who is explaining the facts about each and every spots that we have visited. Also he is very entertaining during travel in the bus. The hotel accommodations are in top class hotels like Radisson, Conform Inn etc. The taketours total expense is very cheapest. Definitely I will recommend this package to my friends. I will book another package with my family to another destination in future. This is a nicely arranged affordable tour if you are here in US for a short time.Everything worked out well. Thank you so much. Good tour and very much worth the price, although slightly tight schedule. Especially time in washington DC in general and air and space museum in particular was not sufficient. Our tour guide Diana is very knowledgeable and shared lot of information clearly about each attraction. She is the best tour guide in the tours that we took in the last two years. I had already recommended my friend and will do again. IT WAS A AMAZING EXPERIENCE AND I HIGHLY RECOMMEND THIS TOUR FOR YOUR PLEASURE. I would like to mention about our guide Olivia who is so patient and friendly in our tour. Even though she has some problems in taking every body together, she was so patient and organized. She handled this tour very well and I believe she is good in person. I would like to thank her for what she has done to me and my family. Thank You Olivia we liked you very much and hope take tours will bring tour guides like you. Its worth the money. The guide Jack was very friendly and helpful. Really enjoyed the tour. The bus was good and all are good. Our three day trip to the Niagara Falls was WONDERFUL!!! Everything about it was just amazing. Jake Yang was our tour guide, and without him it wouldn't have been the same. He made everybody feel like family, he is very professional, a really nice person, we loved him!! And we definitely recommend this trip,and we want to do this again soon!!! Wonderful Tour.. If you wanna see most locations in limited time. Stone our tour guide was nice and helping. Would recommend the tour. It was great tour. Tour guide was also nice and explained things clearly and nicely. Excellent Trip...Enjoyed with family..Tour guide Stone did great job. Worth the price.Recommended !!! It was a great tour, I definitely recommend it, the tour guide Peter was great; really caring and helpful, the hotels were really good and also the transportation with Wi-Fi service. I would definitely take more tours here. our guide mathew was awesome good trip enjoyed the trip i recommend it. Shami D.
Awesome experience. Very good accommodation and bus travel is comfortable. Hello this is nicely conducted tour and especially kudos to tour guide Caroline she was wonderful took good care of my old parents and arranged everything nicely. Dora is the best tour guide!!! Very sweet, knowledgeable and flexible!! Recommend this tour to everyone. My kids and I loved it all as the cover the best attractions!!! Dora our tour guide was great, the bus lacked AC and it was very tight seating. We took 3-day tour with Dora You. We really appreaciate her service mind and useful guided info. Also, we love the Niagra Falls program very much. In addition, our second night at Best Western Hotel Baltimore was perfect. We went last August. It was more than I expected. The tour was awesome. Tour guide very attentive and informative. I've recommended this tour to lots of my friends. I'd do it all over again. We had a great time with taketour for niagra-dc-philadelphia. It was well organized and guided tour. Tour guide angela had managed it so well. Though time given was not sufficient for each attractions, we missed few due to hurry in leaving. Definitely will reccomend this to my friends. Thanks you. Overall trip was awesome experience. Some of the attractions mentioned on itinerary were not part of the trip. Watkin Glen and Secret of Cavern could be excluded and "cave of Winds" from Niagara should be added to trip. It was good experience specially with family. The crew was very accommodative and supportive specially when my father was having difficulty in walking. The only suggestion I have is to have active mobile charging facility and TV. We took 3 day Phili-WashingtonDC-Niagra tour. I highly recommend this tour. It is great way to cover all major attractions in east coast. The hotels were very clean. And out tour guide Stone was helpful. Hi, Recommended:- Value for Money Went with parents and 2.5 years old baby.Thought it to be very hectic but it turned out to be pleasant. Eddie Yu managed it very well. Very systematic and timely. Suggestions:- The lunch was at 11.00 am which is to early by any standard. Needs to be postponed at least to 12.00pm More time for some places in DC like the Whitehouse and the Aerospace. But overall it was worth the travel. Everything was OK, the 2 hotels were very-very good, we saw everything what we wanted. I just got back. The tour was one of the best experience my husband & I had by far. Our guide Mieo was excellent, always attentive & care for each person. I recommend this agency, worth every money spent. CON: Bus# 8700 Driver RUDE! I'm writing this review represent as my mom. This is her first tour in America, and she said it was awesome, especially the tour guide Simon Chen. My mom is the only one who doesn't speak English in the entire group, but Simon kindly gave another tour guide in Chinese for my mom for every stop. With the help of Simon, my mom didn't encounter any language trouble. He even found my mother a companion for her next trip to the West Coast. The other tourists are nice as well, they help taking photos for my mom. The schedule is a little bit tight, but it keeps the group away from crowd, which is great. Overall I recommend this tour. we are taken 3days tour for Niagara FalWe went on tour in the first time. We have a lot of fun. Having fun in the bus. Returned in the entire Tour, ate, saw, and fun, to relax. Our tour guide's name was Jaine. She made us better guide. Many also ask if they're explained well.ls, Washingtion, DC, Pholadelphia. Fui a las Cataratas del Niagara y el viaje fue excelente, Mai el gu铆a muy organizado y los lugares de descanso estaban bien.Recomiendo este tour como obligatorio, en una visita a New York por precio, calidad y responsabilidad. Overall trip was awesome experience. Some of the attractions mentioned on itinerary were not part of the trip. Secret Caverns and some other attractions could be excluded and more attractions from Washington DC should be added to trip. Very good. Well arranged. Benny, our tour guide was fantastic. Great Tour,It covered the complete itinerary,Especially the Tour Guide Mr.Holl was Excellent and Great hotels as well..!! HI , This tour was amazing.We were able to cover most of the attractions because of its well organized itenirary and a very energetic Tour guide TIM.We had ample time to vist and enjoy all the attractions .Special mention for TIM as he was the key in holding this tour a memorable one for us to remember. Great Tour . Our guide Jack was exceptional. Always willing to help and accommodate and taking care of schedule. Although last day was a hiccup due to rains and blocks at DC, he managed well. Overall an excellent experience and worth the money spent. A best trip with L & L Travels. Especially the guide Ms.Vivian's attention and care to each person. I recommend this agency for your Niagara tour. we had a very nice trip..our tour guide ,Tim Li, was very helpful and cooperative and made our trip enjoyable. Must have trip if you don't have much time and want to cover many places and attractions. Wish I got some more time for Niagara Falls Night view. Also, the Thundering Water Cultural Show was canceled by the locals. Other than that, it was pretty awesome experience. Our Tour Guide Jane was pretty efficient and she managed things pretty well. She was more like our school/college teachers who had every tourist under control and she shared a lot of information about the places. Despite our bus met with an unfortunate accident while towards Niagara and around 3 hours were wasted, she made sure that none of the planned attractions visit were canceled. Overall, highly satisfied. Tour was great! Boris is a great tour guide, he accommodates you very well and follow itinerary, very nice to everyone, gives you enough time for all the attractions. Our bus was a little old that was the only complaint I have. Great hotels as well. Boris the tour guide did a great job managing the large group. Definitely worth the ticket price. Would suggest skipping corning glass museum but all the other attractions were definitely great value for money. The best was the maid of the mist but the Niagara old fort was very good too. Bus could be better with charging points but the accommodation was great considering what we paid for this tour. Would definitely recommend this tour to those planning to go for Niagara. We had a great time thanks to this tour! Our tour guide Ding was really friendly, tried her best to give us time and make our trip better. even some groups of people kept being late on each stop we made (plz try to be on time. if you are late, you are stealing other people's time and make everyone more tired:/) All the itinerary was great. We liked it that we could see Niagara falls twice at night and also on daytime. We had to wake up early in the morning but it was okay as all the itineraries were worthed, nothing to miss. Thank you for this great tour with good price, and special thanks to Ding! and our driver Luis! We really recommend this tour and also want to try other tours from this company! Wonderful tour. Everything was on time. Hotels booked were good.Tour guide was very helpful . THE BEST. After reading the trip advisor reviews for this tour I was a little worried, but it was actually well organised and enjoyable. The accommodation was great, and you get to see a lot in a short space of time which was ideal for me. Only criticism is that there are currently building works at horseshoe falls so you can't see them from the American side (luckily I could walk to Canada). The trip was totally amazing and the tour guide was great in giving detailed information about the places visited. The accommodation was very nice. The tour was a new experience for me. I didn't know if I was going to enjoy long bus ride with so many people, Max our tour guide made it very pleasant for my wife and I and informative. I will be looking forward to going on my next tour. Max is very efficient hard-workingand patient he is the best. Driver gave us a safe drive and Tour Guide Max Liang gave us the best service. It was a nice tour. Time is well managed. Hotels are great. only food place in Niagara Falls welcome center is the worst and 3 times expensive. The attractions are beautiful. Good Value for your money. Overall it was a fabulous trip. Really good budget trip. L&L travels have done really good job in making sure all arrangements were made. I have traveled alone on this trip and never felt so comfortable before. It has great experience and would recommend it definitely especially if you are short on time and budget. Tour guide Max was brilliant and knowledgeable. He was very supportive and understanding. 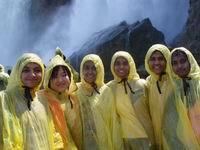 It was a shame we couldn't maid of the mist at Niagara falls, nor jet boat ride to the falls. So that was a big disappointment. At Washington DC, could do with more time to spend at the monument etc. Again due to things beyond operators control, couldn't see white houseb the way we wanted to but that's luck I guess. Accommodation was excellent on both days with very clean rooms. In general I would highly recommend Take tours but advise to Google around to see if there are any restrictions in place before you book. This trip was fabulous. The tour guide was loving, calm, and caring.The attractions were impressive. We recommend this trip for everyone and travel with Catherine, she is a great tour guide. I enjoyed this tour very much. Boris, our tour guide, definitely handled this tour very well. He made sure that we followed the itinerary so that we won't cut our time short to enjoy the tour. He even bought us breakfast for the third day just to make sure we won't be hungry. Thanks to Boris and to our driver for taking care of us during this tour. Definitely worth it and highly recommended! I was traveling alone so I was a little apprehensive...but I must say it was a very enjoyable trip. The people on the bus were very friendly, the tour guide on our bus (James) was so professional and went out of his way to help and accommodate everyone and the bus driver was always on time and got us everywhere safely. Frequent stops were made for us to eat and use bathroom facilities. The places and sites visited were exciting and beautiful and plenty time given to enjoy them and our tour guide was very knowledgable with all types of facts for our knowledge. The best value for money tour I ever had. Food stops are good as we are Asians. Time is well managed and has maximized it. Places visited were all great. Activities during the bus trip are lively, we never get dull during trips. I am recommending this to friends and we are planning to go next year. Just wanted to say thank you so much for such a brilliant tour. This was the first time doing a group tour and I don't think I could have asked for anything better! Everyone on the group was very friendly, the locations were above and beyond what I had hoped for, and having such a helpful and knowledgeable tour guide (Boris) just made the whole trip perfect. This was a great trip for the price. Plenty of activities to choose from and hotels n food stops were great. I'm planning on going again in the summer. Overall good tour. Good value for money. This is the worst tour I don't recommend it at all. Bus was really poor and no toilets. Some attractions were cancelled. Poor planning of schedule. Hotels are below average. Food places are really poor. Communication is really difficult. This tour is good value for money! Heaps of attractions to see & good accommodation! An excellent trip.Tour guide James was quite energetic and efficient.He planned and timed the attraction visits so well that we had just enough time for all of them. Driver Gary was amazing..he was behind the wheels 3 days in a row and the drive was quite smooth( one of the smoothest I have ever been).I would really recommend both. Keep in mind that the attractions are optional though the guide might not specify that. I wouldn't recommend the imax movie and you may better of spending that near the falls. The niagra jet boat ride was amazing. Keep atleast $180/head for the attractions. First night stay in holiday inn was great. Second night in red roof inn was also good but the hotel smelt badly of smoke. Overall good value for money if you want to cover many destinations in a short while. I would definitely recommend.